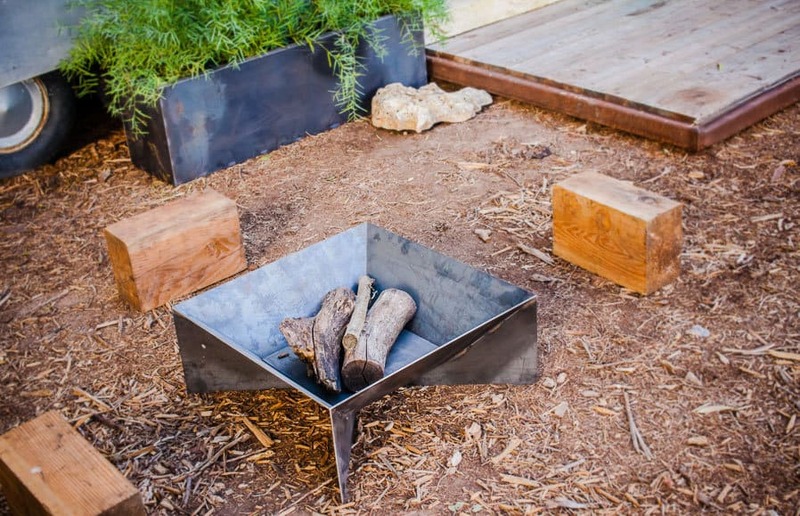 Colder nights have began but no need to rush indoors – one of these 35 metal fire pits could extend your outdoors season with warmth and social fun. You’ll find one fire pit design that will suit your patio or outdoor setting. Whether you are a purist or you prefer a more dramatic style, some of these coolest design ideas will certainly inspire you. And what’s more reliable and easier to setup than a metal pit. Most don’t require any prep work – just set it in place, get some firewood and start using it. 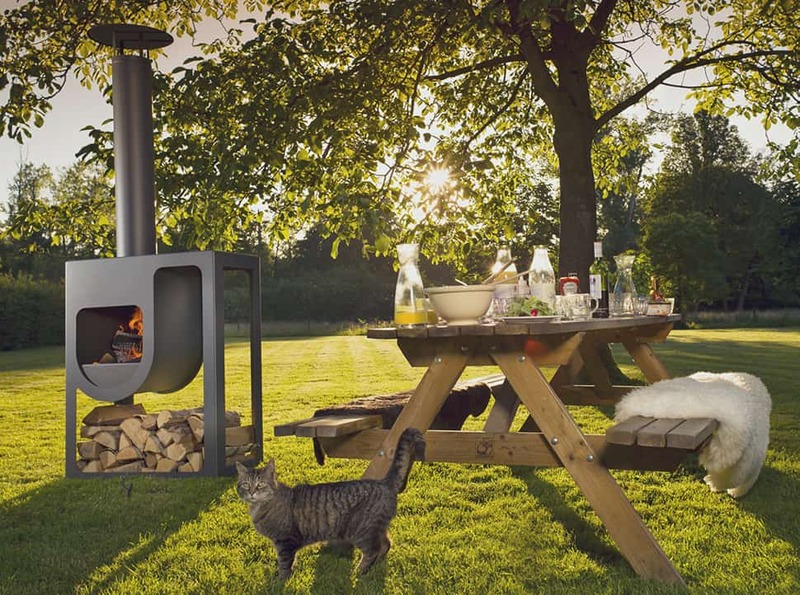 In terms of fuel you’ll have the choice among the traditional wood burning pits, those fueled by propane gas or by bio ethanol. Time to get cozy by the fire! 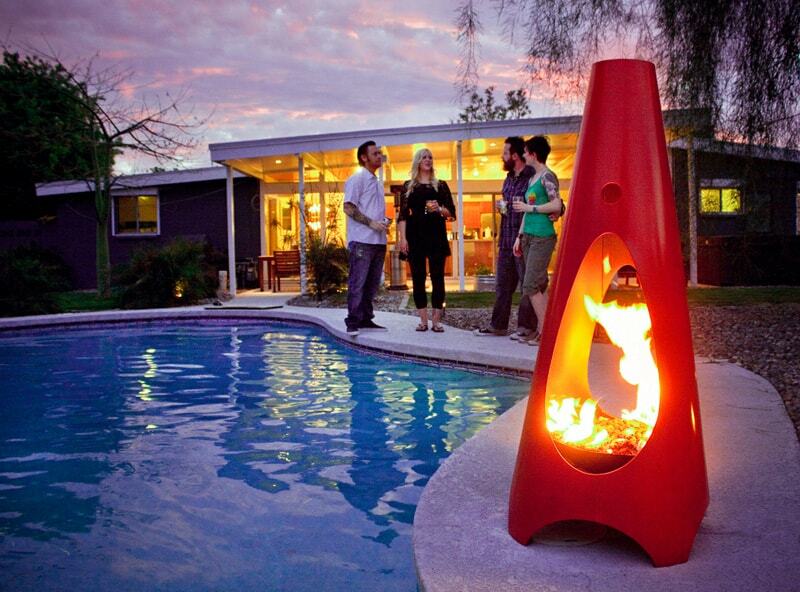 Modfire’s Urbanfire (above) is an ultra modern fire pit and a piece of art. 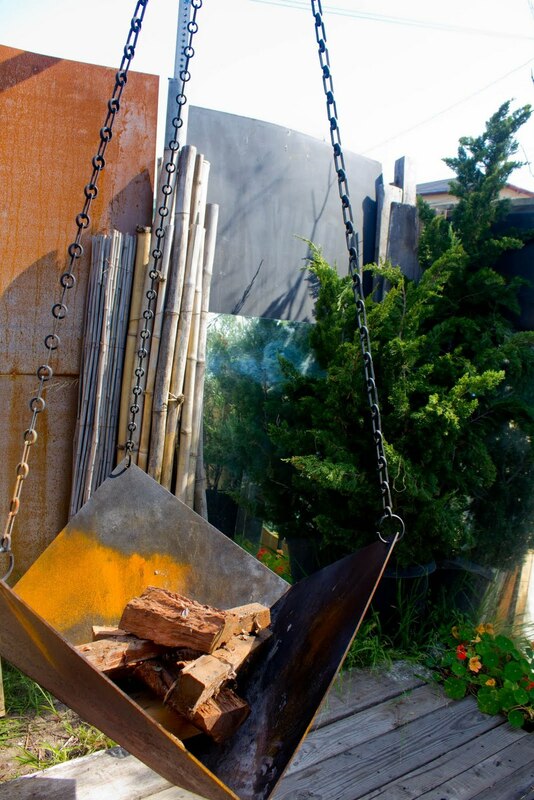 Hand-made from natural steel, it comes in different finishes, ranging from natural metal to strong colors (blue, red, orange etc) or luxurious copper. 48-inch tall (about 120 cm), this impressive cone-shaped design will catch everyone’s eye. 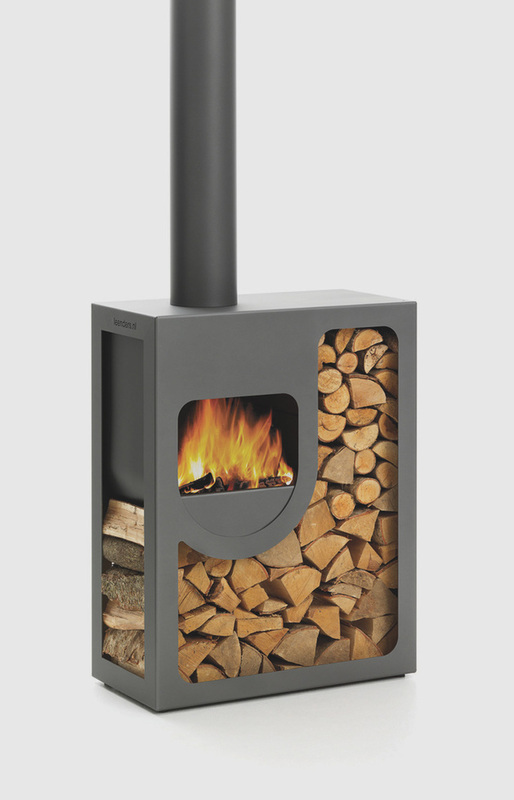 It comes as wood burning or propane fueled. Katan (above) means teepee tent in Swedish, and that’s where the Dutch manufacturer Harrie Leenders got inspired from in shaping this particular pyramid fire pit design. Made in corten steel, at first it has a rusty metal look, but with time and rain it will oxidize and become rather black. It has a practical wood storage compartment at the bottom. 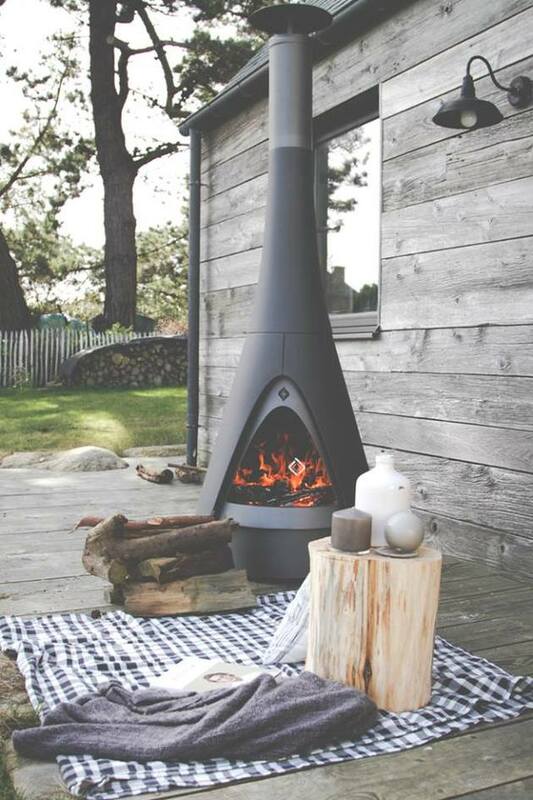 Pharos is another conical fire pit / fireplace design from Leenders (above) but it’s also mobile which is ideal for outdoors. It can be easily moved around on solid wheels around your patio or garden to find the best suitable spot for the season. It’s made from 6mm thick cast aluminum and is available in several color combinations. How cool is its chimney! We don’t know who makes this red fire pit but it’s sure one of the coolest cone designs out there. You can try to learn more at the source. 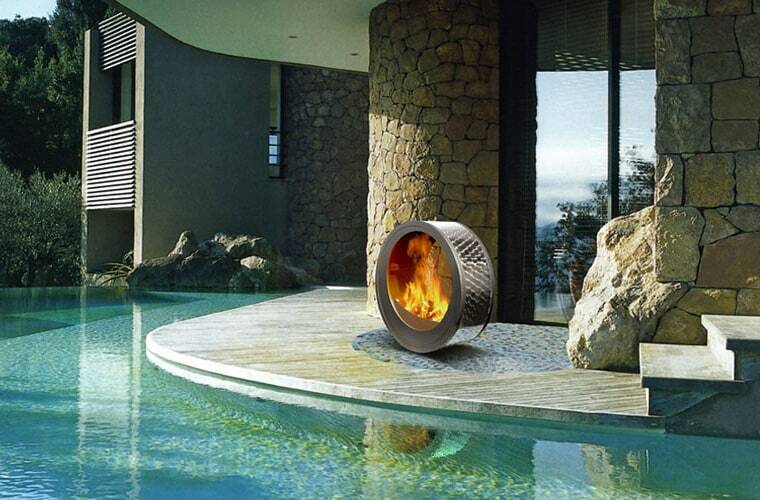 Zero by AK-47 is a contemporary round fireplace designed to be surrounded by people. 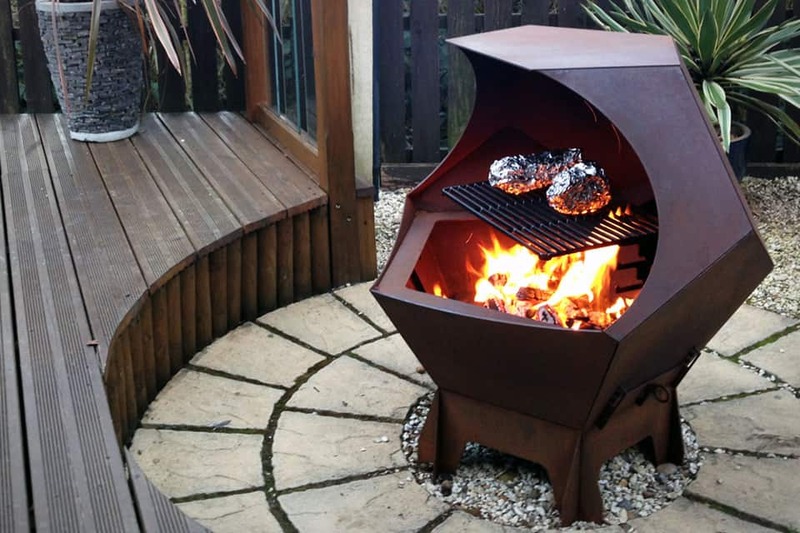 145 cm in diameter (4.75 feet), it’s made up of a central metal fire pit and an external firewood storage and seating unit. 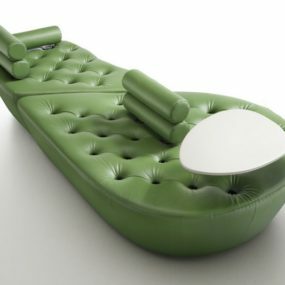 It makes an amazing centerpiece for large social places and it gets a more intimate dimension at home, surrounded by friends! Harrie Leenders gets more contemporary with Spot (above), a compact outdoor fire pit which can also be used as a stove, and is designed to fit even the smallest outdoor spots. 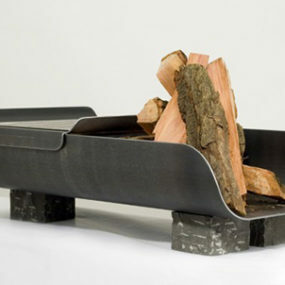 A 3-in-1 functional design object, Spot combines a pit, wood storage and an optional clip-on service tray. 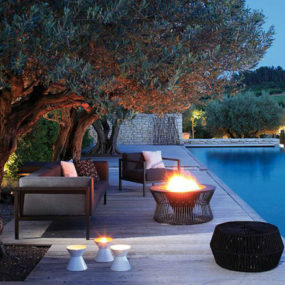 Perfect to enjoy a drink around the fire. Cheers! Spot fire by Leenders is a perfect outdoor accessory to enjoy by an entire family. 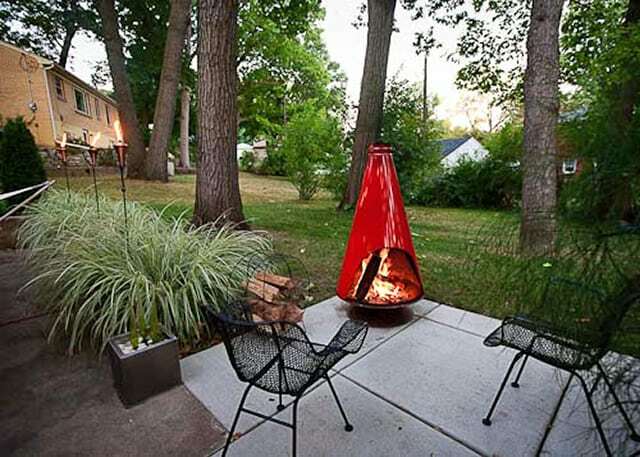 Is this the coolest fire pit idea you have seen yet? It’s hanging! Was found in someone’s backyard in Venice, Los Angeles, CA. Dubbed ‘The Ranch Boss’, this large hanging fire is for those who want the absolute finest, as according to its maker Cowboy Cauldron. Cauldron hanging metal fire pits are made either in cast iron or thick pressed steel, and are built to last for generations. You can also use the Cauldron’s suspended bowl design as a grill, and it’s a great accessory to have to entertain your guests. 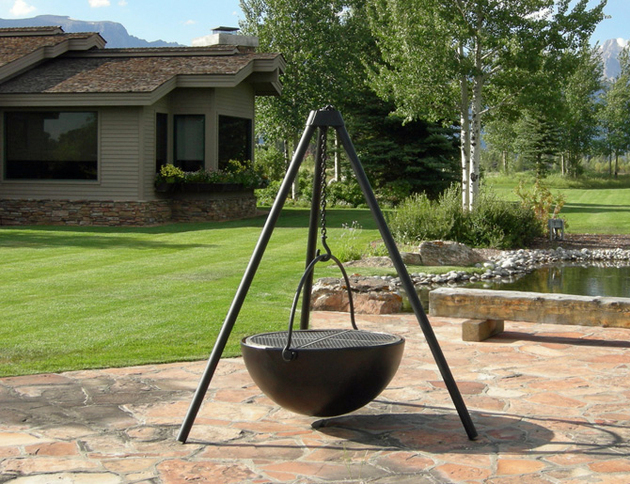 Each Cauldron pit comes complete with the tripod frame, suspension chain, hook and pin assembly, Cauldron basin, removable fire grate, and a cooking grill. Source. The Ranch Boss may be the largest Cauldron but not the only one. They come in 4 different sizes – look at the chart above to pick one that fits your patio or backyard best. Source. Bowl pits are some of our favorites – what can be more aesthetically pleasing and conveniently shaped to safely make a fire than a bowl design. Especially an oversized pit like the one found in this Napa Valley weekend house by Jim Jennings Architecture. An design by Erin Martin, this huge bowl is a outdoor dream. The whole settings is so simple and cozy at the same time, photographed by Marion Brenner. Above, using a cast iron wash pot as a fire pit seems like a great idea – at least it worked for one gentlemen. It’s big, about 2.5 feet in diameter, and it looks cool. Source. 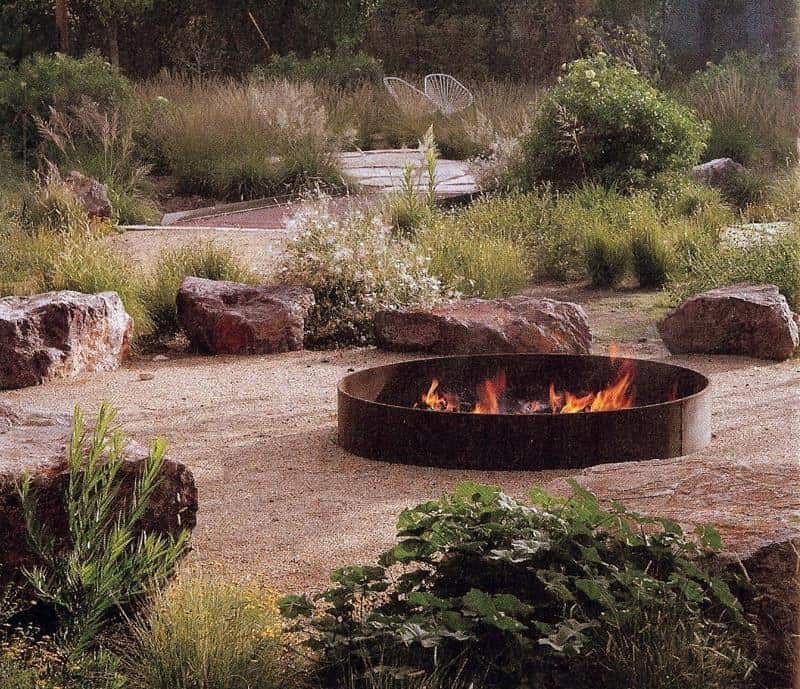 Another awesome setting with a metal bowl fire pit as a centerpiece, rustic and funky even – notice those carved out seats. Don’t they remind you something? Photographed by Radostina – check out her great works here. 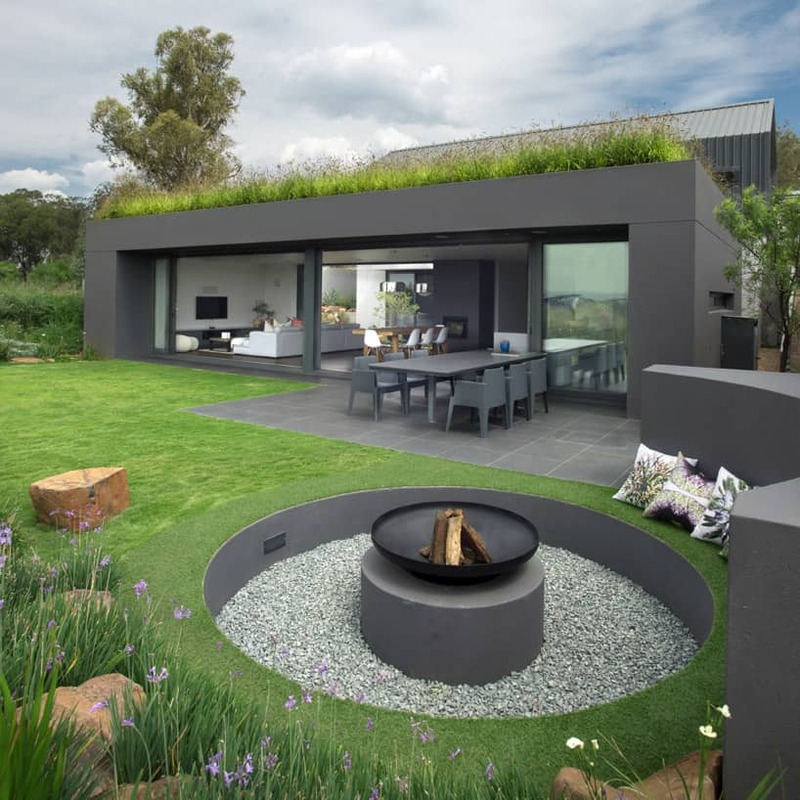 The above idea for a sunken fire pit setup is from Johannesburg, South Africa – source. 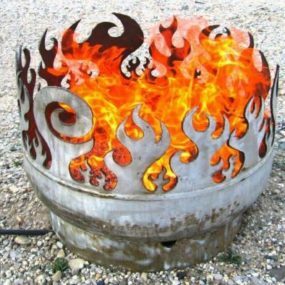 What a clever idea and potentially interesting DIY project – a smaller and more shallow metal bowl is placed on a concrete pedestal, creating a center fire in the middle of a circular recess in the ground, and with a concrete retainer wall. A bowl made up by welding together disc blades from a plowing tractor, this DIY fire pit is great for a backyard camp fire. Looks almost artistic. Source. 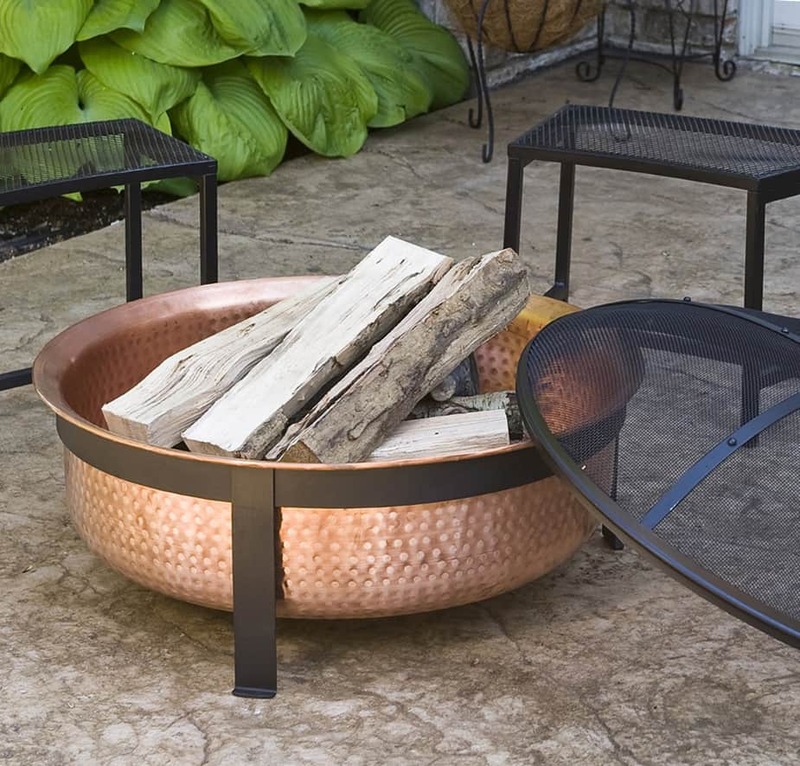 If you like the look of copper then Hayneedle offers this CobraCo copper fire pit with cover. It’s an eye-catching home accessory that is beautifully hand-hammered for a shiny finish. It comes with a protective vinyl cover to keep clean, and is 30 inches in diameter. 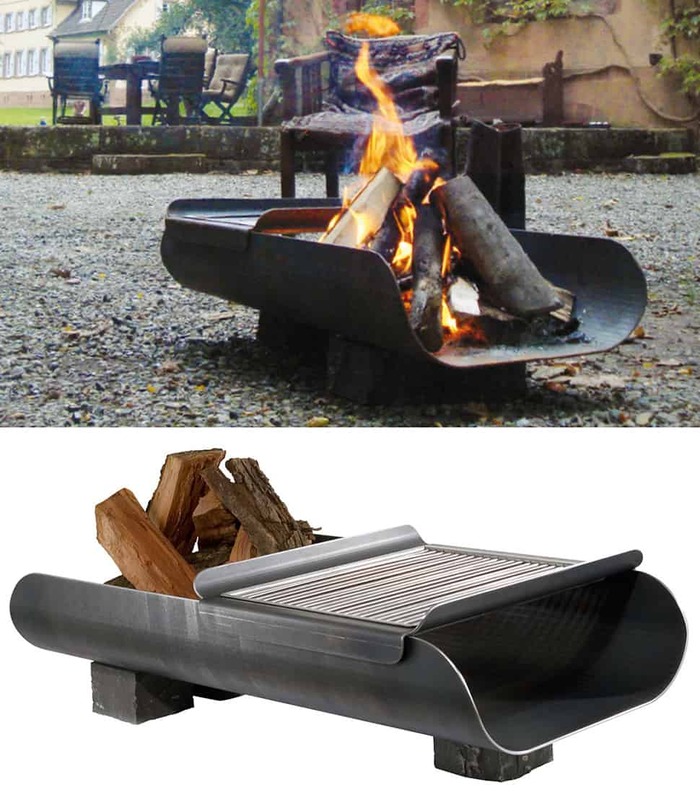 The above contemporary fire pit grill Langgrill can be purchased from Connox. It’s a German design with a long bowl and a minimalist look of stainless steel, measuring 45cm wide by 95cm long. Sometimes less is more and this stands true for the Bella Vita stainless steel fire pit (above). 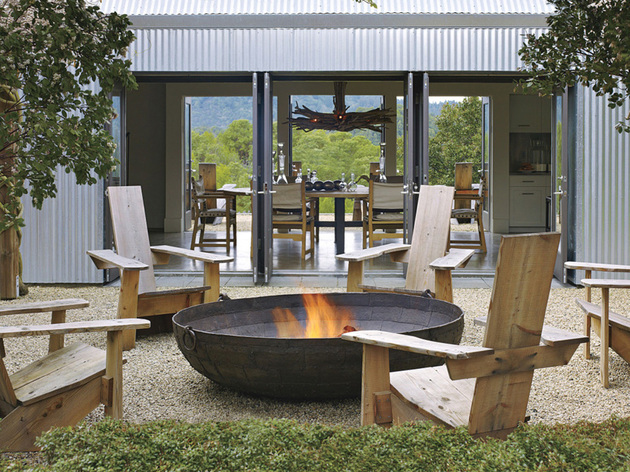 A functional steel artist, Rick Wittrig made this round contemporary fire a maintenance-free one, so it requires no effort and offers pure relaxation moments to those seated around it. 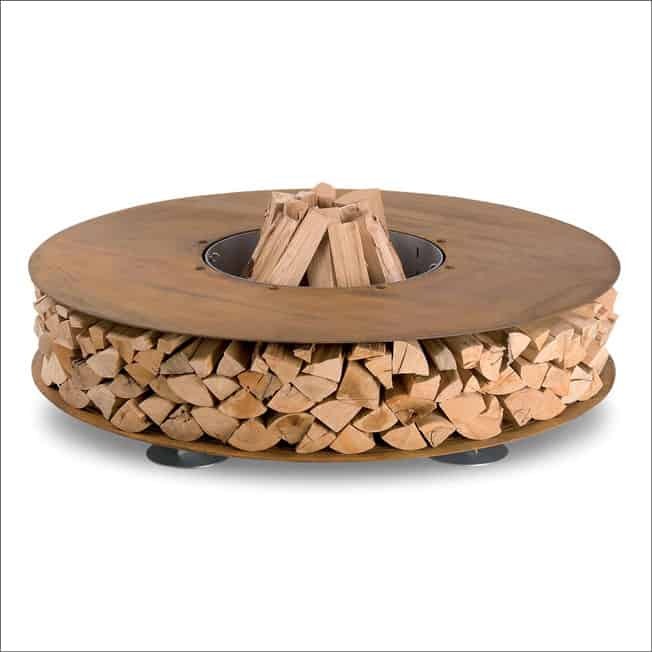 46-inches in diameter, it holds enough wood for one entire evening of burning! 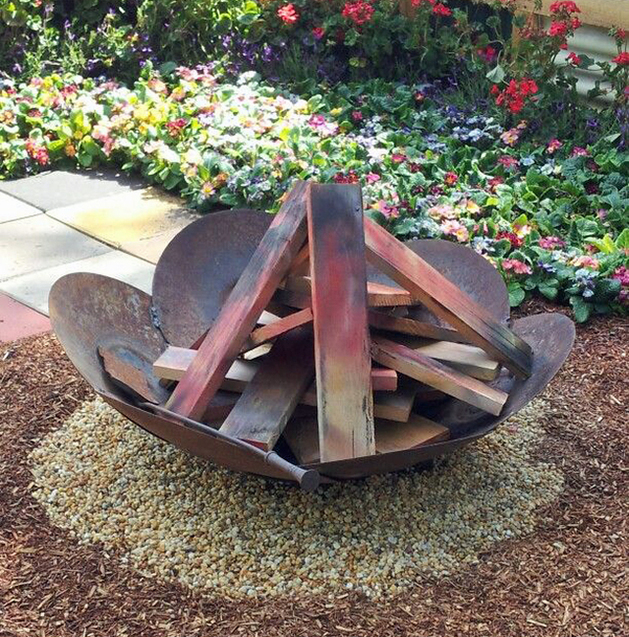 Another modern fire pit design with a shallow round steel bowl on a metal stand – this is a great decor piece for a contemporary home. The 63cm diameter bowl is sanded by hand to ensure natural rust to form over time, and stainless steel legs are also hand finished. 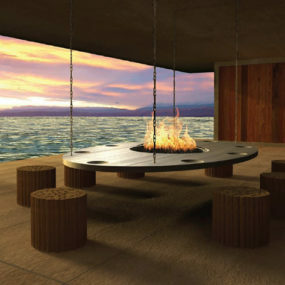 The above mobile fire pit named Eclypsya, is a modern circular design by Benjamin Mesnard and is made by Arkiane. It stands out by its unusual design and its mobility. Just roll it outside and enjoy the fire on your terrace in all security, as the bio ethanol flame is protected by glass on both sides. Inspired by the desert nomads who would settle down to make a fire, this beautiful pit is sure to get a permanent place in your lifestyle! 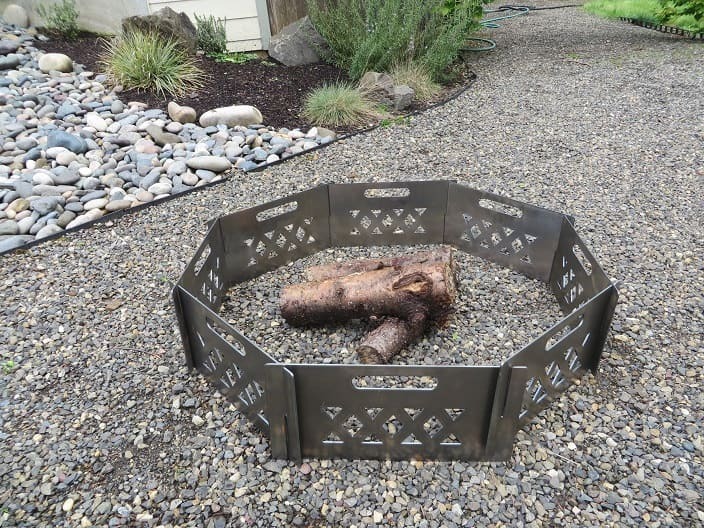 A simple square fire pit weld as a DIY project, from four 40″ x 20″ sheets of 12 gauge hot rolled steel – here’s the tutorial. 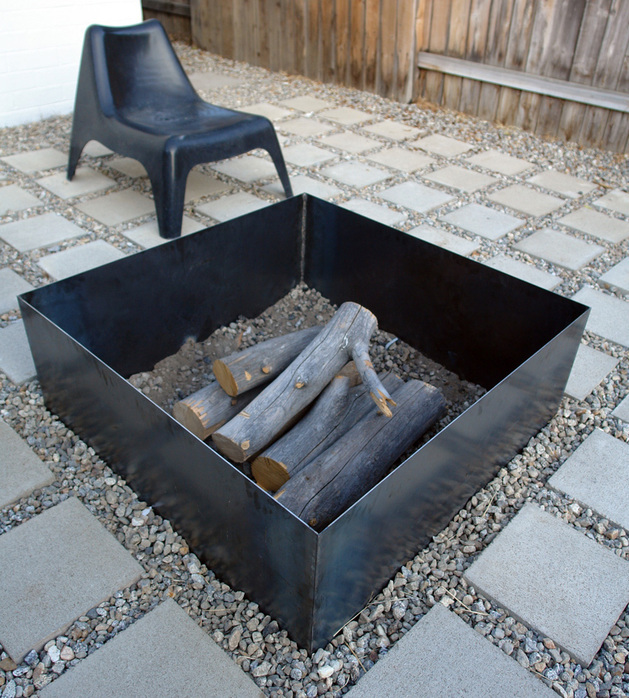 The Plodes Geometric Fire Pit (above) reminds us of origami designs. Designed by John Paul Plauche from Plodes Studio, who did projects for Google’s offices. Available in two sizes and two metals – A36 low-carbon steel or Corten steel. By purchasing additional grate top or cedar top you can turn this pit into a grill or table. 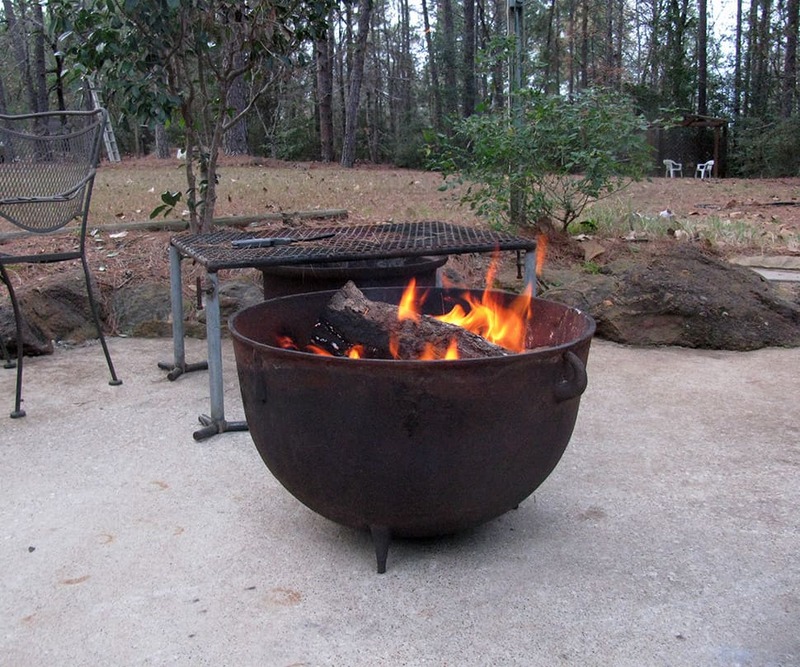 A similarly shaped fire pit design is available on Etsy. 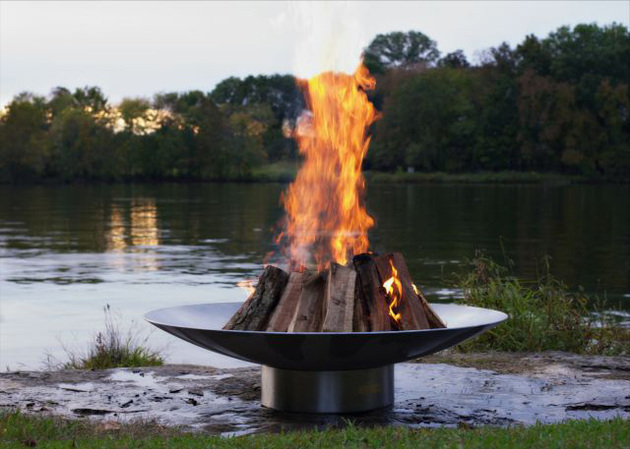 With hot-rolled 14 gauge steel sides and a 10 gauge fire bowl, the Fin pit is made to last. 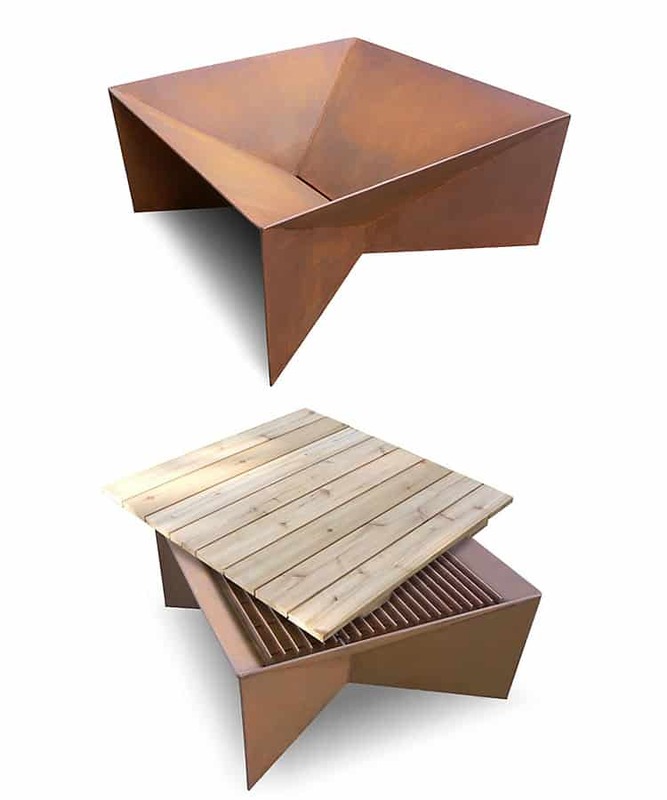 A slightly different version of the above two geometric designs and also slightly more pleasing aesthetically, this is the Contemporary Outdoor Fire Grate by Peter Keilbach, a designer from the UK. 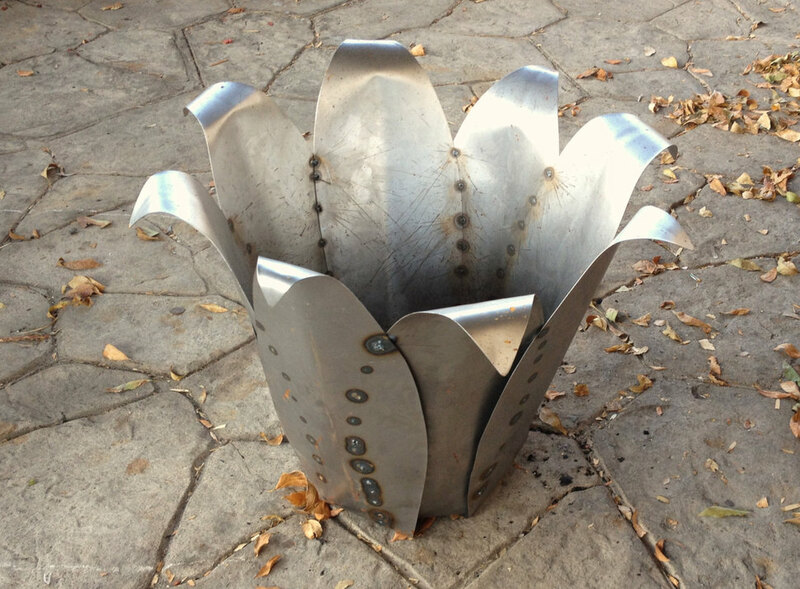 It’ll look attractive in your garden, and can be used as a grill. 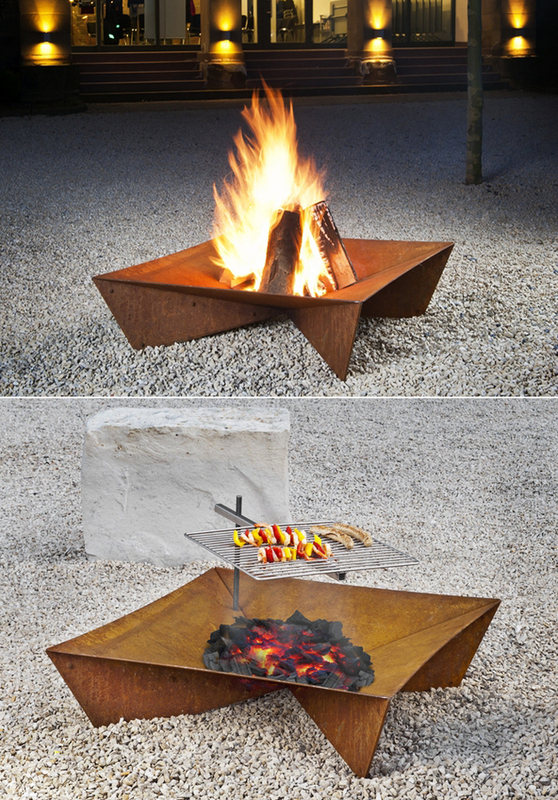 Talking an unusual geometry … here’s a metal fire pit and barbeque combo named Decahedron. The name speaks for itself. Made from recycled steel, The Great Bowl O’ Fire is a sculptural piece. 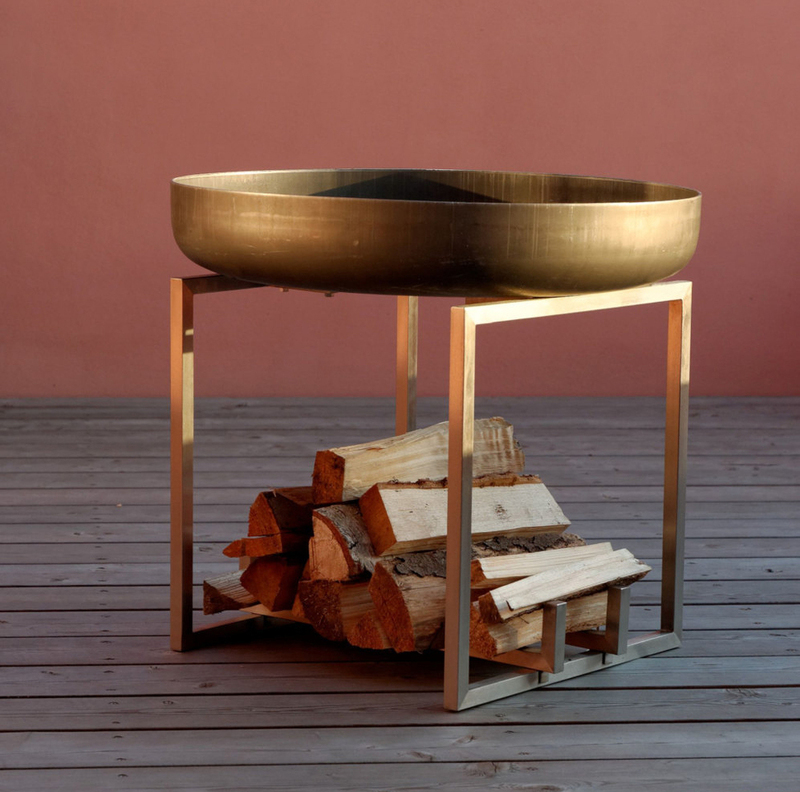 This fire pit never stops to amaze how proportionally it’s designed. 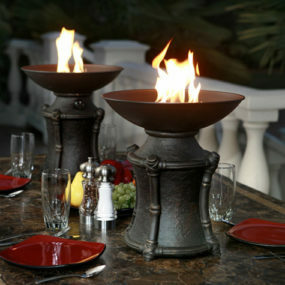 The 37-inch diameter bowl seems in flame even when the actual flame is not on! 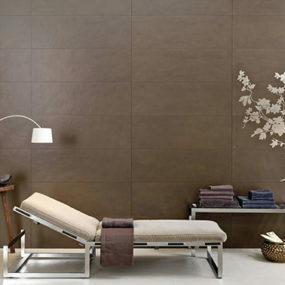 Stunning at floor level, it gains an “Olympic” feel when raised on a pedestal. Some of the most known art fire pits on the market today are the hand cut fire pit spheres by artist Melissa Crisp. Melissa has many beautiful designs, we just picked 4 that we believe are some of the most amazing art pieces from this designer. Each design is one of a kind and comes with a numbered metal plate for authenticity. 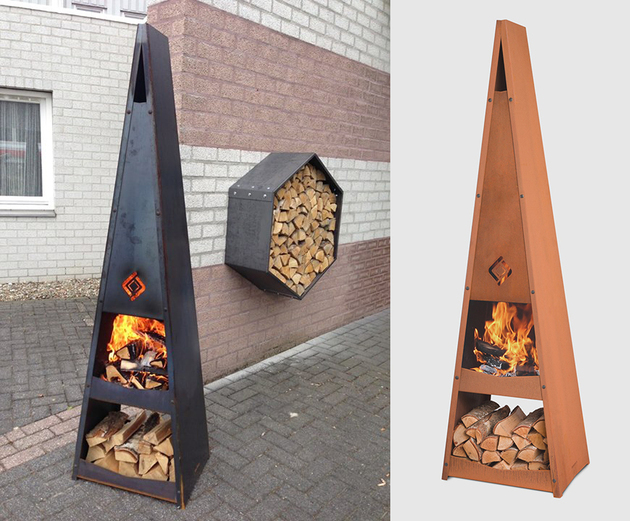 They are wood burning by default but can be converted into gas burning fire pits. 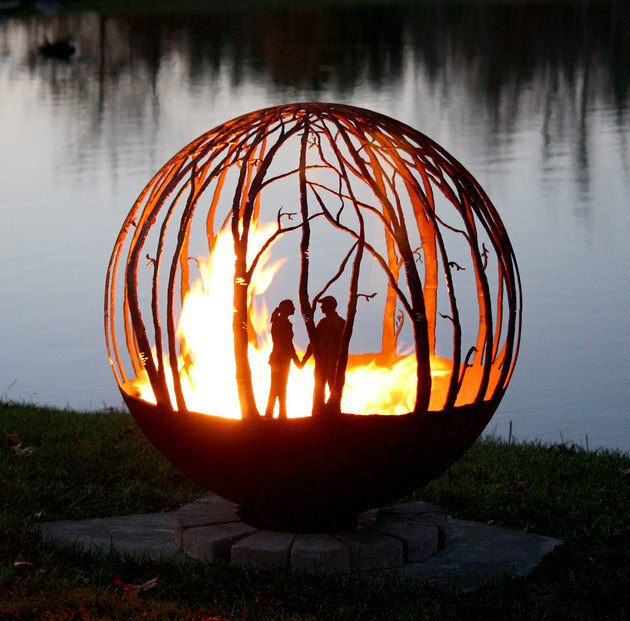 The above Winter Woods Fire Pit Sphere by Melissa Crisp has a romantic edge to it. For sweethearts, you cannot find a better piece to enjoy a fire on starry nights. 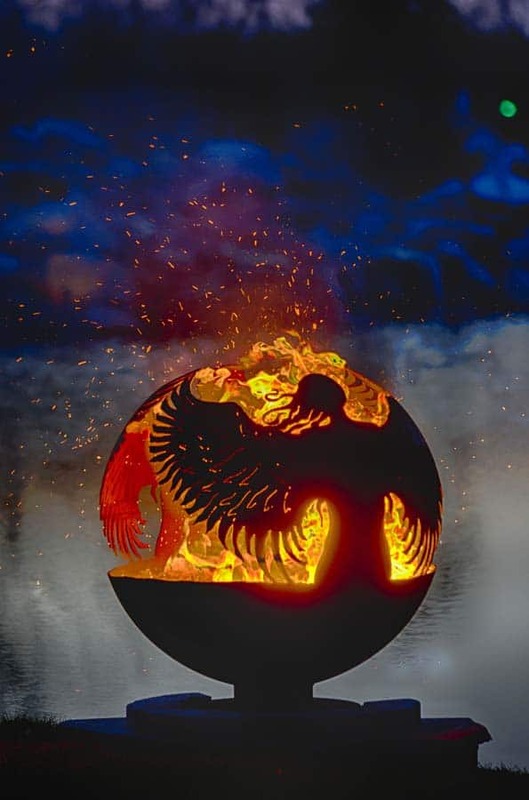 This real piece of art above is the Earth & Sky firebowl that features a simple metal cup on a craggy tree branch base, and is 53″-54″ in diameter. 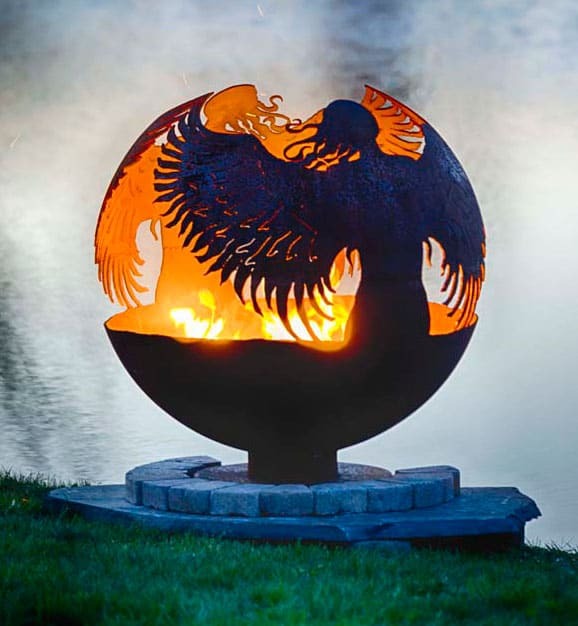 The Hidden Angel fire pit sphere could easily be one of the most beautiful pits we’ve seen. The Hidden Angel fire sphere features two angels with their wings wide open as if they are protecting you from fire. 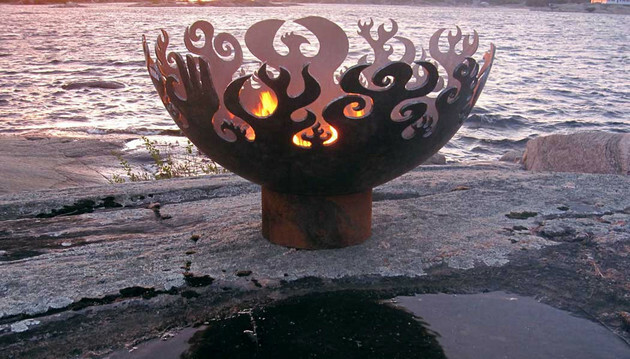 “This sculptural fire bowl is beautiful even when unlit and would be stunning in any garden. The angel wings wrap around the sides of the bowl and meet, completing the circle.” Source. 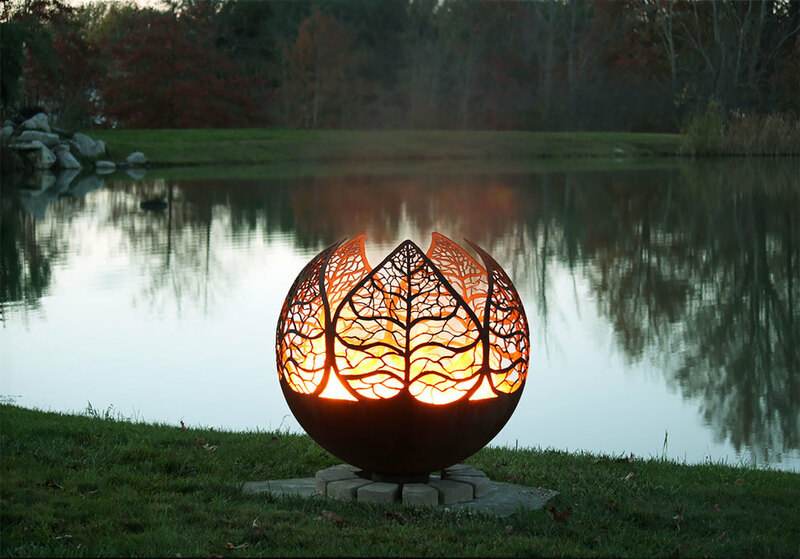 This very balanced, aesthetically pleasing design (above) is the Autumn Sunset Leaf Fire Pit Sphere by Melissa Crisp. This unique artisan fire bowl is 37 inches in diameter and can be a great patio centerpiece even without the fire. Above is the exotic looking Lotus fire art – handmade in stainless steel and gas burning. 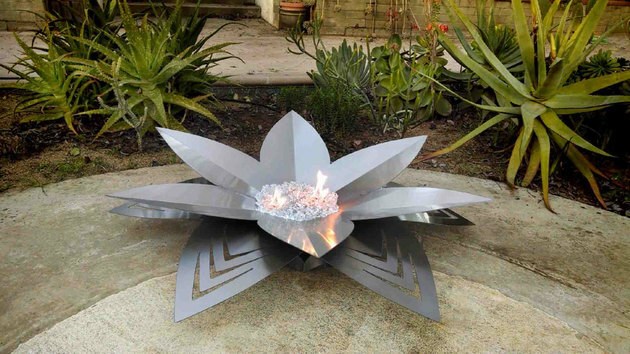 Modeled after an agave plant, this artsy fire pit design comes in raw steel so you can watch it forming its unique patina. A simple metal fire ring can often make the best outdoor setting idea. We love the oversized round design – it just seems so natural, for a fire pit to be round and big. 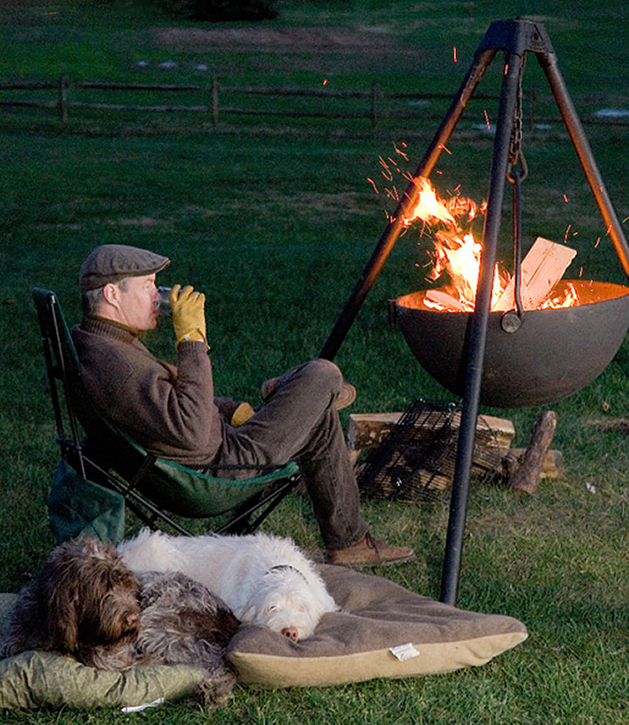 This portable fire ring could be a neat idea for camping. 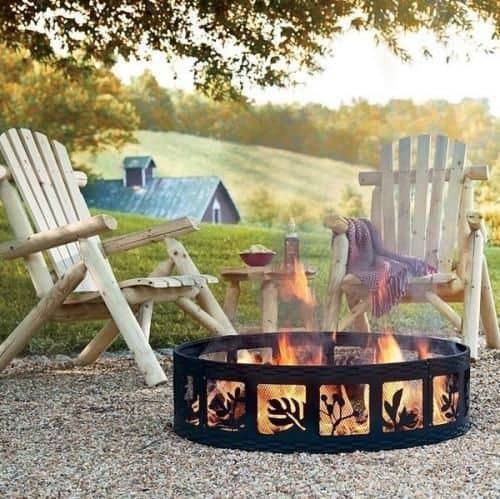 Above is an adorable fire ring design for a cozy rustic setting – source. 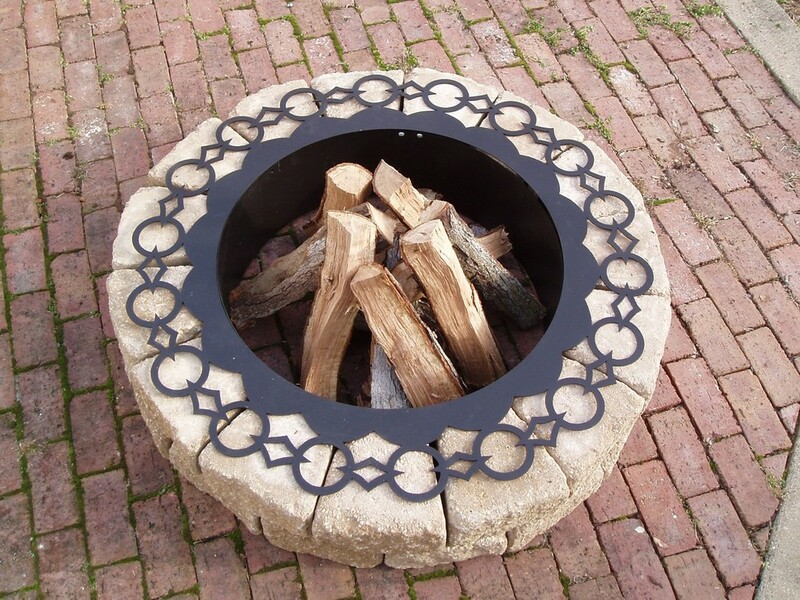 This cool, decorative metal fire ring can easily fit most landscapes. It consists of a steel liner and a decorative top ring, and was designed for building a fire pit with retaining wall blocks. 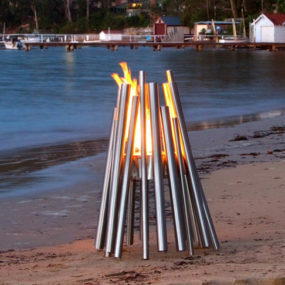 Finally, a couple of unusual and neat outdoor setting ideas – the fire pit tables. 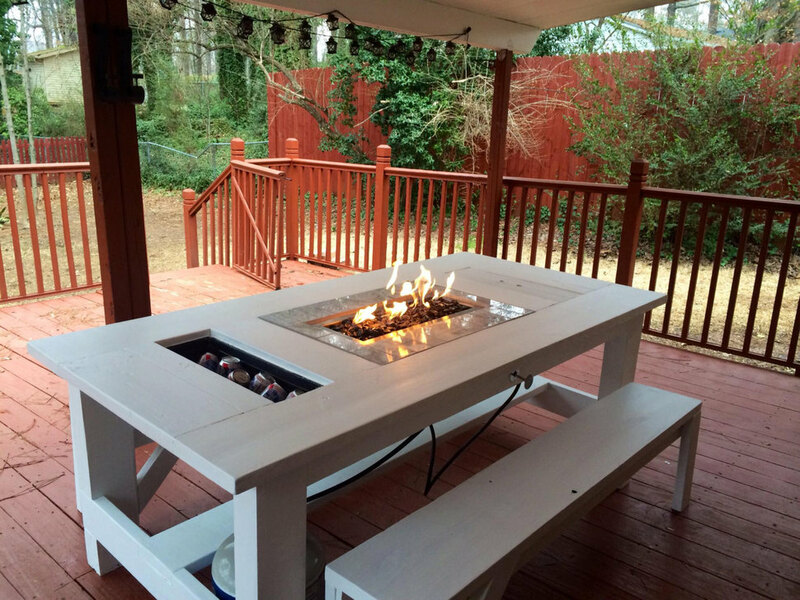 An outdoor table with a built-in cooler and a fire pit. 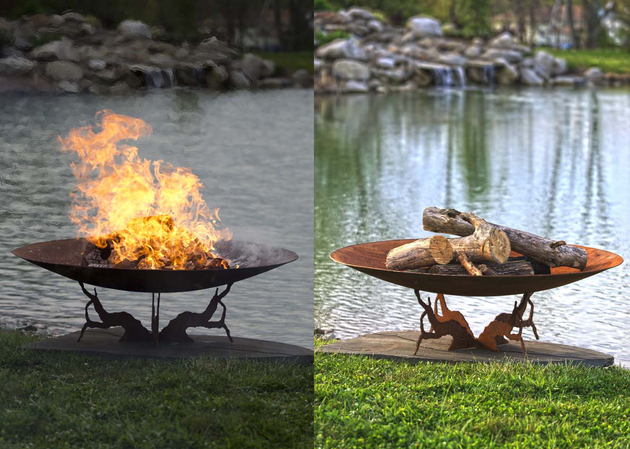 A color changing Gabian fire table. 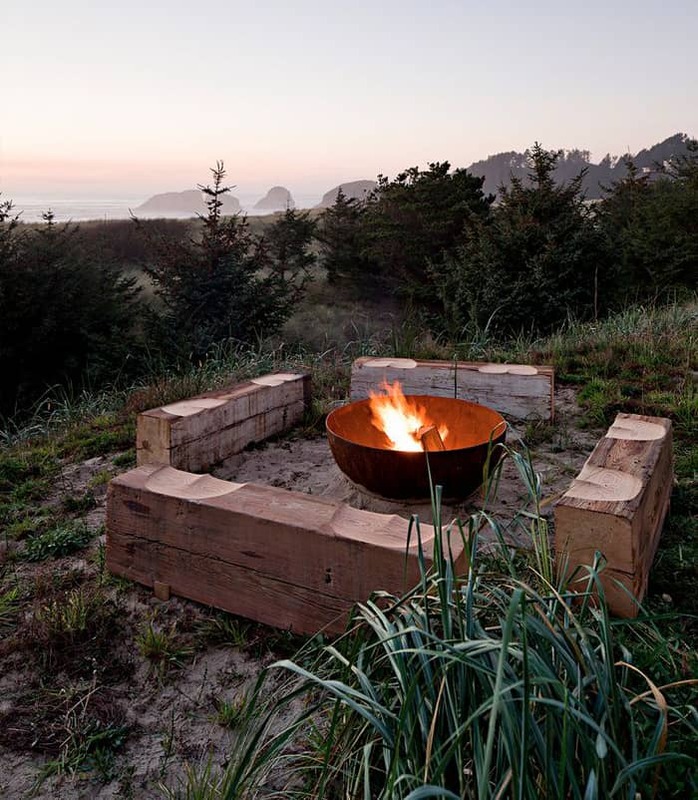 For even more inspiration, check out these round fire pit ideas from AK-47.